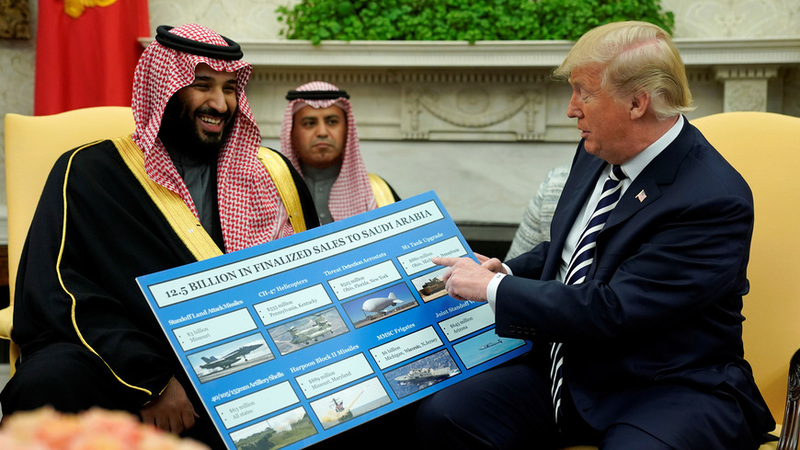 On May 20, 2017, U.S. President Donald Trump and Saudi Arabia’s King Salman bin Abdulaziz Al Saud signed a series of letters of intent for the Kingdom of Saudi Arabia to purchase arms from the United States totaling US$110 billion immediately, and $350 billion over 10 years. The intended purchases include tanks, combat ships, missile defense systems, as well as radar, communications and cybersecurity technology. The transfer was widely seen as a counterbalance against the influence of Iran in the region and a “significant” and “historic” expansion of United States relations with Saudi Arabia. Saudi Arabia is a key U.S. ally in the Middle East. Saudi Arabia’s security forces have relied on U.S. equipment, training, and service support for decades, officially as a counterbalance to Iranian military influence in the region, and to help protect the Kingdom from extremist attacks. Between 2011 and 2015, Saudi Arabia was the destination for nearly 10% of all U.S. arms exports. In 2016, the Obama administration proposed a series of arms deals worth $115 billion, including warships, helicopters, and maintenance. However, some parts of this deal were blocked by the administration in December 2016 after Saudi Arabia’s airstrikes and targeting procedures in neighboring Yemen drew controversy. After Saudi warplanes targeted a funeral in Yemen’s capital Sanaa, killing more than 140 people, the Obama administration announced its intention to review U.S. military assistance to Saudi Arabia. The 2017 deal was partially created with the help of Jared Kushner, son-in-law of and senior advisor to President Trump; Kushner had cultivated relationships with Saudi royalty during the transition and personally contacted Lockheed Martin during the deal-making process. The signing occurred at the Riyadh Summit and was part of Trump’s 2017 series of visits to the Vatican, Saudi Arabia, and Israel. It also was related to a $20 billion investment in mostly American infrastructure. Saudi Arabia signed billions of dollars of deals with U.S. arms producers and energy companies, including Lockheed Martin, Boeing, Raytheon, General Dynamics, Northrop Grumman, General Electric, Exxon Mobil, Halliburton, Honeywell, McDermott International, Jacobs Engineering Group, Rowan Companies, National Oilwell Varco, Nabors Industries, Weatherford International, Schlumberger and Dow Chemical. Saudi Arabia joined The Blackstone Group in May 2017 in a $40 billion fund to invest in stateside infrastructure projects. The White House hailed the deal as a “significant expansion” of the two nations’ “security relationships”.The United States Secretary of StateRex Tillerson described the deal as “historic” and said that it would counter Iran, and urged them to halt support of destabilizing forces in the Middle East, although he hinted the United States would be open to discussions.